*Cyracos is a registered trademark of Naturex Inc.
Ortho• Sleep is AOR's premium sleep and relaxation formula. The most important neurotransmitters known to regulate sleep have been combined with the most powerful herbs traditionally used to promote sleep, yielding a product like no other. Primary Uses: Ortho• Sleep contains a carefully formulated blend of nutrients and compounds that have been shown to be effective in combating insomnia and promoting and restoring healthy, restful sleep. These include neurotransmitters like GABA and melatonin, as well as 5-HTP, a serotonin precursor. The formula further includes the amino acid L-theanine as well as valerian root, passionflower extract, and lemon balm, all of which possess relaxing properties and work to increase the activity of GABA in the brain. Ortho• Sleep is perfect for those who have difficulty with any stage of sleep, including falling asleep, staying asleep, or feeling rested upon awaking. Ortho• Sleep may help in cases of jet-lag, shift work or insomnia. Some people may require a larger or smaller dose than others. Ortho• Sleep may work quickly for some but take longer to work for others based on individual body chemistry and the reason for the sleep issues. If you have used the individual ingredients found in the formula with no success, Ortho• Sleep may offer a more powerful natural solution. 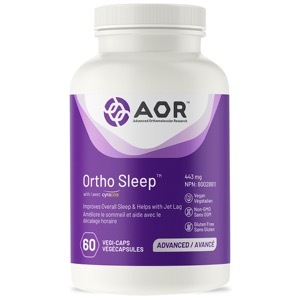 • AOR's Ortho• Sleep won Gold in the 2012 Alive Awards for Best Herbal Product, and Bronze in the 2013 Optimyz Awards for Best Sleep Aid. • Sleep disturbances are being called the new silent killer, being as detrimental to health as stress and poor diet. There is good research to back up why you should aim for 7-8 hours of good quality sleep per night in order to maintain good health. No more, no less. Take 1-2 capsules before bedtime with/without food, or as directed by a qualified health care practitioner. Brendler T, et al. Lemon Balm (Melissa officinalis L.): An Evidence-Based Systematic Review by the Natural Standard Research Collaboration. Journal of Herbal Pharmacotherapy; 2005, Vol. 5; Issue 4, p71-114. Bruni O, Ferri R, Miano S, Verrillo E. L -5-Hydroxytryptophan treatment of sleep terrors in children. Eur J Pediatr. 2004 Jul;163(7):402-7. Dhawan K, Dhawan S, Sharma A. Passiflora: a review update. J Ethnopharmacol. 2004 Sep;94(1):1-23. Gamma-aminobutyric acid (GABA), Monograph. Altern Med Rev. 2007 Sep;12(3):274-9. Ito K, Nagato Y, Aoi N, et al. Effects of Ltheanine on the release of alpha-brain waves in human volunteers. Nippon Nogeikagaku Kaishi 1998;72:153-157. Melatonin. Monograph. Altern Med Rev. 2005 Dec;10(4):326-36. Monograph. Valeriana officinalis. Altern Med Rev. 2004 Dec;9(4):438-41.